When I was growing up, I was lucky enough to have a grandfather who grew lots of vegetables (this is where my passion for gardening started). Without fail, every summer he would drop off bags of green beans and we would spend an afternoon breaking off the ends and putting them into a pot. I loved about green beans – the color, the texture, the flavor… Now that I have my own family, I’ve carried on that same garden tradition and green beans are always an addition to the garden. Green beans are one of the easiest and most popular summer vegetable varieties to grow in your garden. What makes the green bean so easy to grow is because once planted, they require little attention other than a drink of water now and again. One reason that green beans are favorite choices among gardeners is that they have high germination rates of 70 percent and the seeds can remain viable for 3 years. Therefore, they are great for storing long-term garden plans. As well, bush beans, in particular, are a great cover crop for warmer climates. We prefer growing the Blue Lake Bush variety of green beans because of their many uses. They were originally developed as a canning bean, but quickly became a fresh food favorite and are now commonly served along with salads or steamed as a healthful side dish. One drawback to planting bush beans is they tend to take up precious space because they do not grow tall like pole beans. But, what they lack in height, they make up for in production. In addition, they require less work planting, staking, weeding, and watering. Another incentive to grow more beans in the garden is they have a symbiotic relationship with soil-dwelling bacteria. How this works is that the bacteria take gaseous nitrogen from the air in the soil and feed this nitrogen to the legumes; in exchange, the plant provides carbohydrates to the bacteria. The gardener can take advantage of this and plant nitrogen-loving plants near the growing beans like corn, lettuce, tomatoes, squash, cucumbers, and cabbage. I usually plant a few bush beans around the base of a tomato plant. This provides added nitrogen and helps to shade the delicate roots in the soil. Native Indians also used this companion gardening trick and planted corn and squash near green beans (although they used pole beans to grow up the corn stalks). This is called the “Three Sisters” method and makes great use of garden space. Like we mentioned, green beans are one of the easiest plants to grow, but there are some tricks to enhance the production process. Plant them at the right time. Green beans prefer warm weather, so make sure all danger of frost is gone before planting. For the best growing results, when the air temperatures are between 60-70 degrees F, sow seeds directly in the soil where it will receive full sun. Those living in northern climates should plant beans at the beginning of the summer growing season. If your area has longer seasons, you may be able to harvest multiple crops. As a precautionary note, green beans do not take well to transplanting and could get stressed or damaged in the process. Simply plant the seeds (with their eye facing down) about 3 to 6 inches apart and leave about 1 to 2 feet between rows, depending on the size and shape of the garden bed. Green beans usually germinate in 7 days so keep an eye out for emerging young sprouts! Succession planting is best. Keep in mind that bush beans produce most of their crop all at once. 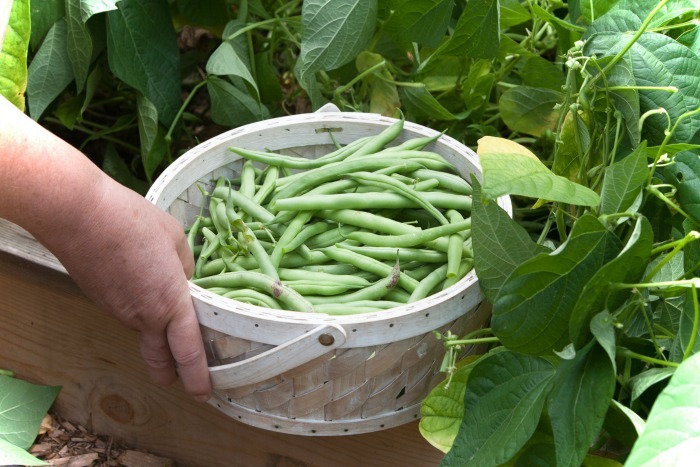 To take advantage of a long growing season, plant a new crop of green beans every 2 weeks. As a rule of thumb for planting, plan for about 10 to 15 green bean plants for each person in your household each time you plant a new crop. Mulch ’em. Green beans prefer warm, moist soil. During the growing season make sure that soil is kept moist during flowering and fruiting, as hot and dry conditions can make them drop their flowers or young beans before they’re big enough to harvest. A thick mulch of 1-2 inches under the plants will keep soil moister and cooler in the middle of summer, as well as serving to feed the earthworms and other soil life. Deep watering is best. 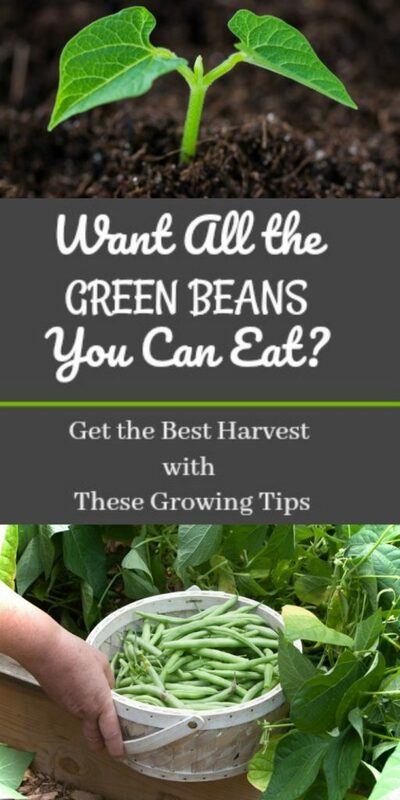 Ensure that your green bean plants receive one inch of water a week for good growth. Deep watering at least once a week (when there is no rain) is preferred, especially during the blossom and fruiting stage. Rotate your crops. Rotating the growing areas keeps the garden healthy and prevents crop-specific pests and diseases from building up and carrying over from one season to the next in the soil. For best measure, beans should not be grown in the same spot more than once every four years. Although green beans are relatively easy to grow, you could run into some problems now and again. Pests: Bean weevils, Mexican bean beetles, leaf miners, cutworms, and aphids are some of the most common pests that will affect your green beans. Once your green bean has lush foliage, be on the lookout out for damaged leaves, eggs underneath leaves and signs of pests. Releasing beneficial wasps could be advantageous in preventing pest infestations. For instance, the Pediobus wasps can help mitigate Mexican bean beetles. As well, planting companion flowers and plants such as yarrow, dill, and catnip around your garden can also help control pests. As well, control cutworm damage by making a protective collar around the young plants. Here’s a great video how to make these. Removing any damaged leaves from the plant can help it recover. Spraying soapy pepper water on plants with pests is also a great deterrent. Diseases: Mold, funguses, powdery mildew, root rot, and other diseases can affect growing green beans. The best way to circumvent this is by prevention and have your soil tested to ensure it has the proper balance of nutrients. By doing so, you will know exactly what your soil will need and, in turn, will reduce the diseases and pests that could affect your plants. Soil kits are available at all garden centers. Another preventative measure is a crop rotation every few years. Excessive Moisture: Moisture or over watering could also be a culprit. Keeping leaves and fruit are off the ground will greatly reduce diseases brought on by this. 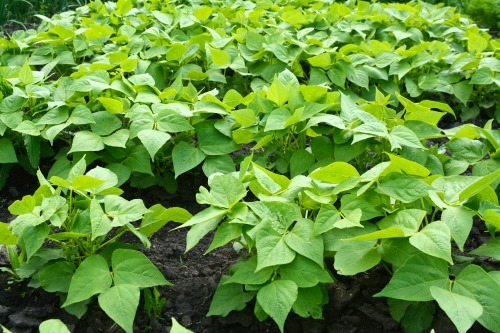 While bush beans do not require staking, but keeping the leaves and beans from sitting in wet soil will reduce the number of pathogens splashed on the leaves from the ground. Some gardeners lay medium-sized sticks around the bean plants to act as a barrier. Moreover, for added measure, stay away from your bean plants when their leaves are wet. Bacterial diseases become sticky when they are wet, which means they can attach to your hands, clothes, and tools, and you can carry them from plant to plant. If you find diseased plants, remove them from the garden right after you harvest the beans. Disease pathogens can grow amidst the stems and foliage and infect future plantings. If you are looking for an easy-to-grow plant for the garden, green beans are an ideal addition. As well, they are a great starter plant to help teach young gardeners about plant care. Make sure you plant plenty of extra plants for enjoyment!